Psychiatrist, philosopher, revolutionist and author, Frantz Fanon is an instrumental figure in post-colonial theory and Middle East studies. 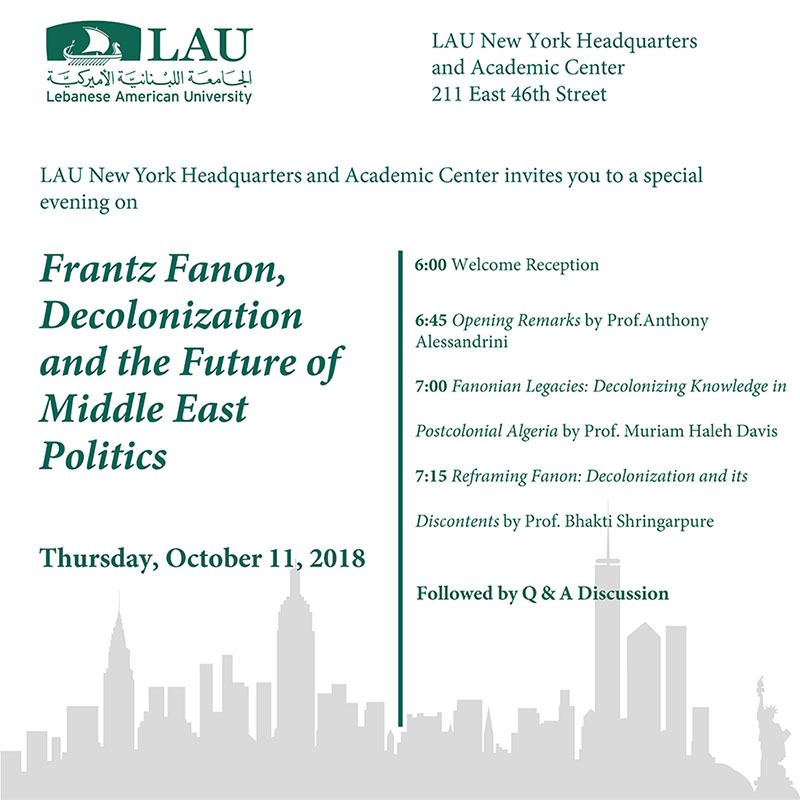 On the occasion of the publication of the English-language translation of Fanon’s previously uncollected/untranslated writings in Alienation and Freedom, LAU NY will host a panel discussion with Prof. Anthony Alessandrini, Prof. Bhakti Shringarpure and Prof. Muriam Haleh Davis about the significance and relevance of Fanon’s work today, with a particular focus on how his work might speak (or not speak) to contemporary politics in the MENA region. Anthony Alessandrini is Professor of English at CUNY Kingsborough and of Middle Eastern Studies Program at the Graduate Center, CUNY, where he is also a member of the Committee on Globalization and Social Change. He is the author of “Frantz Fanon and the Future of Cultural Politics: Finding Something Different”; the editor of “Frantz Fanon: Critical Perspectives”; and the co-editor of “Resistance Everywhere”: The Gezi Protests and Dissident Visions of Turkey, and recently published “Children Imitating Cormorants,” a poetry collection. He is a Co-Editor of Jadaliyya E-Zine and is on the faculty of the Brooklyn Institute for Social Research. Muriam Haleh Davis is an assistant professor of history at UC Santa Cruz. Her research interests focus on questions of political economy, racial classification, and postcolonial studies in Algeria. She is the co-editor, with Thomas Serres, of “North Africa and the Making of Europe: Governance, Institutions and Culture” (Bloomsbury Academic, 2018). Bhakti Shringarpure is Assistant Professor of English at UConn(Storrs) where she teaches postcolonial literature and theory, gender studies and conflict studies. She is also editor-in-chief of WARSCAPES magazine. Her edited volumes include “Literary Sudans: An Anthology of Literature from Sudan and South Sudan,” “Imagine Africa: Volume 3 and Mediterranean,” an anthology of migrant journeys. Her book “Cold War Assemblages: Decolonization to Digital” is forthcoming in 2019.